Question:I need to add/remove bookmarks/annotation to a PDF on an Android App. Is there a third party application for that? From what I've found some software can do this but it isn't ported to Android and none of the PDF viewers free and easy to process. I hope I can get a solution on VeryPDF? Answer: VeryPDF just released a set of free online PDF writer which can help add/remove annotation but it can not help you add or remove bookmarks. 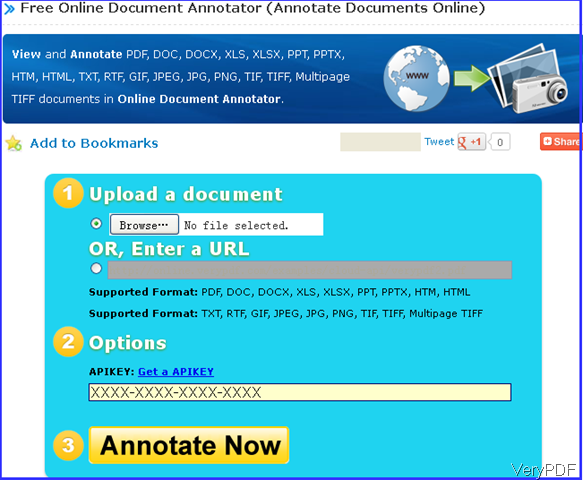 It is named as VeryPDF Free Online Document Annotator. The most important is that this software allows you to annotate PDF under Android system. You can use it as PDF writer under Android system. Meanwhile this free online application also allows you to annotate other file document like DOC, DOCX, XLS, XLSX, PPT, PPTX, HTM, HTML, TXT, RTF, GIF, JPEG, JPG, PNG, TIF, TIFF, Multipage TIFF documents. 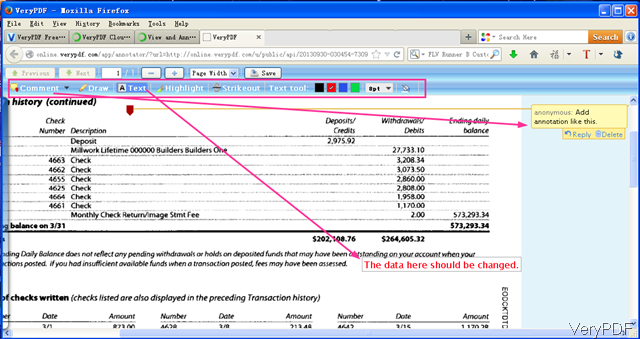 So by this software even if you do not have Android Office installed, you can annotate Office file. You can annotate image even if you do not have image editor installed. Please check more information of this software on homepage, in the following part, let us check how to annotate PDF by this PDF Android writer. The following snapshot is from the website, please have a check. All the steps have been marked on the website. When you use this software, please make sure your Android device could connect with website. Please open website on your Android device, then do as the website shows. Upload PDF file either local PDF or online PDF—> Input the API code if you have, or else there will be watermark on output—> click button Annotate Now then you will enter another website. Step 2. Annotate PDF under Android system. When you click button Annotate Now then you will enter PDF writer website. The following snapshot is from annotation page, please have a check. There are buttons at the top of this annotator. You can add comment to annotate PDF, add text at any place. When you need to use it as PDF writer, maybe you can upload a blank PDF or blank text then write text on it according to your needs. When you finish adding text, annotating PDF, please click button Save then there will be a URL of newly produced PDF. By the link, you can save it as a new PDF. All the operations could be done under Android system. By this application, you can create PDF from various file formats, annotate PDF under Android system. But now it can not be used to add or remove bookmark. But we will try to add this function in the future version. During the using, if you have any question, please contact us as soon as possible. This entry was posted in VeryPDF Cloud API and tagged annotate PDF. Bookmark the permalink.